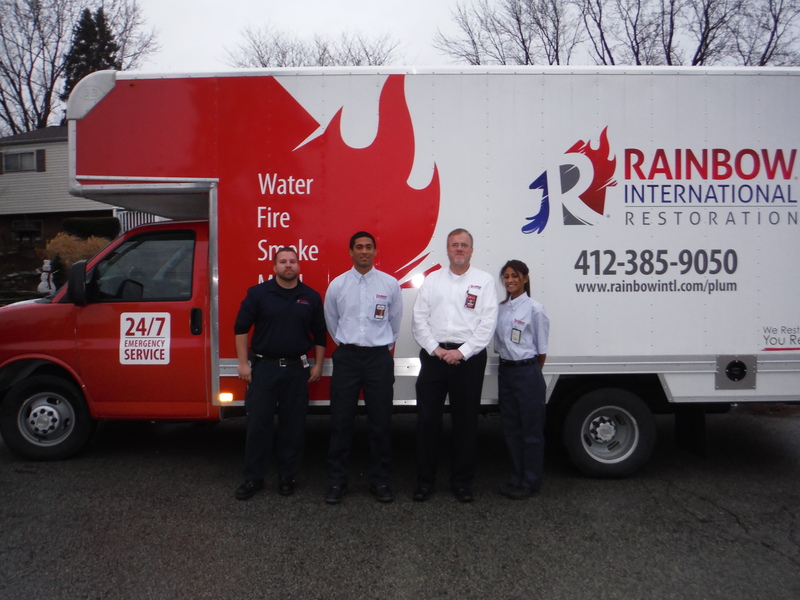 The experts at Rainbow International are fully equipped to handle any disaster situation, no matter how bad the damage is from fire, flood or potentially dangerous mold. With years of experience in the disaster restoration industry, IICRC-certification and superior customer service, Rainbow International of Plum is ready to help, 24/7. We serve homeowners and businesses in Plum, Monroeville, Murrysville, Delmont, New Kensington, Penn Hills, Oakmont, Fox Chapel, Gibsonia, Verona and Springdale. For all disaster recovery jobs, we work closely with your insurance carrier to ensure an efficient restoration and claims process. Area customers also rely on Rainbow International of Plum for deep cleaning services. Our carpet cleaning uses advanced steam equipment to remove built-up dirt and allergens in your carpeting and area rugs. To rid your home of stubborn tobacco, pet accident or other pervasive smells, our deodorizing services will improve indoor air quality. Area customers also look to us as a solution for impossible-to-get-out spots and stains and for cleaning and polishing tile, grout & hard surfaces for a shine that lasts. We take pride in our community – we are members of the local chamber of commerce and sponsor local youth sports teams. With so much experience in professional cleaning and disaster restoration, call Rainbow International of Plum today. Home restoration services you can count on when you need it most of all. Water damage must be professionally mitigated before the onset of mold and mildew, and to prevent or reduce permanent structural damage. We act fast, within two hours’ time, with IICRC-certified water damage restoration to remove standing water and moisture trapped in walls, floors, ceilings, cabinetry, carpeting, furniture and even precious personal belongings, to get you back to pre-loss condition. Our certified fire remediation professionals respond quickly, within two hours’ time, to make your damaged area safe and cleaned out. We secure the area by boarding up damaged windows and tarping over burned rooftops to protect your property from the rain, snow and wind. We carefully remove burned structure, soot and smoke odor then perform full reconstruction service for complete, start-to-finish restoration. Mold can be a real health issue, and mold remediation can be a potentially hazardous process. Our certified experts follow strict regulations to ensure your health and home are not in danger. Our mold removal service fully detects and safely removes mold without spreading spores. "Great job! My carpeting looks great!! Very, very thorough. Reasonably priced. Friendly. Great job!! Would definitely recommend!!!!" – Pamela R.